Designed using its own Sense UI language, the HTC Mail app offers useful customizations such as changing the font and its color, highlighting text, and more. Text Reflow feature automatically adjusts the email content to fit the mobile screen. HTC has been slowly releasing the native Sense apps on Google Play over the past two years. The applications are usually compatible only with HTC hardware. 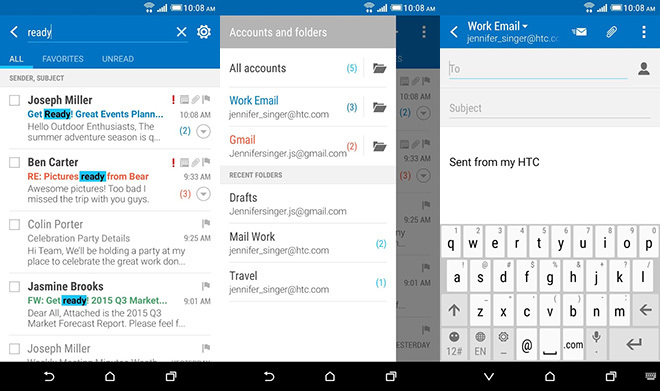 Just like other email apps, HTC Mail supports Microsoft ActiveSync along with IMAP and POP3 to keep emails up to date. It also supports Microsoft Outlook and Yahoo as an option.